No one wants to acknowledge that they have lice, let alone that their children have lice. The misperception that lice infestation is a result of unsanitary conditions is one of the most persistent. It’s also completely untrue. Parents should be secure in the fact that if their children contracted lice, it’s not their fault. Kids are not more susceptible to lice, and kids who get lice aren’t dirtier. So why do some kids get it and some don’t? The simple and straightforward answer is “head-to-head” contact. Michelle Aloisio of The Hair Angles had her own outbreak that prompted her to start treating other people’s children for lice. For her, it’s both a personal crusade and a business. As The Hair Angels grew and gained a surprising number of clients throughout L.A., they recently had to open a new salon in Santa Monica servicing Brentwood and the surrounding areas to accommodate the overflow. “The salon is beautiful and designed as more of a treat than a treatment,” said Michelle of the new location. A cheerful shade of blue sky and clouds brightens the room and puts kids at ease. A portable DVD player is available for children who want some entertainment while they sit for treatment. The approximately two-hour treatment was something Michelle felt strongly about reshaping into something positive. Something more like a haircut than a lice removal treatment. 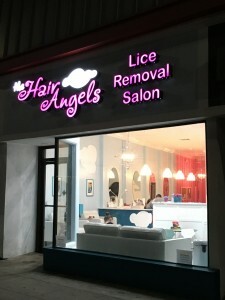 How Do The Hair Angels Treat Lice? Each treatment is performed by a staff member licensed in The Shepherd Method, starting with a thorough wash. After that, each strand of your child’s hair is examined and any lice are removed. The treatment gets rid of 98% of lice and nits in the initial appointment. The Hair Angels even have a 100% guarantee if you come in for a follow-up appointment 5-7 days after the initial treatment and follow the instructions to get rid of lice from your home. It’s easy to get lice if you don’t know how it’s spread and much harder to get them when you do. Lice need to come in direct contact with a head of hair and hitch a ride by crawling into the hair to spread. Because this contact is easily prevented when you know how to handle it, there’s little chance of lice spreading once it’s contained and the right treatment is applied. To schedule your appointment at The Hair Angles new Santa Monica salon, call us at 424.832.3876.